A Smart Metering Program (also known as Advanced Metering Infrastructure) with an estimated cost of $1,173,000. The intent of this capital improvement is to replace existing meters which are manually read each quarter, with new meters which are read automatically on a daily basis. These new meters are not only more accurate, but with their automatic readout, provide the District with an ability to more fully understand where and when water is being used within the District. This information will provide the District with a more complete understanding of water usage patterns and thereby improving its water management and planning. PROJECT STATUS: In Spring of 2013, the District solicited bids for purchasing and installing this program throughout the District. Final contract negotiations are currently underway, and it is anticipated that the installation of meters and other necessary infrastructure (i.e. computers and transmitters) will begin later in 2014. An emergency generator was proposed for the District to purchase to insure that the District could continue to pump water to the various storage tanks within the District, in the event that electrical power is unavailable. The projected cost for this generator was $144,000. After additional evaluation, it was deemed that the long term maintenance, storage, and testing costs, along with the initial cost of acquiring a generator, did not justify the District purchase of a generator, when a less cost effective solution was available. This lower cost solution was to provide the necessary electrical connections and switch gear at the Base II pump station and to rent a portable diesel generator to power the District’s Base II water pumps, in the event of a major power outage. In the event of an emergency, a temporary generator can be secured and connected to the District’s pumps well before the District’s storage tanks are depleted. The total cost for these improvements was under $35,000.PROJECT STATUS: The requisite improvements to the District’s electrical and switching gear has been made and tested with a portable 250 Kilowatt generator. 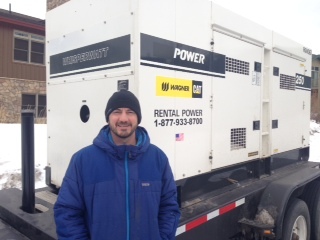 Ron Mentch, Assistant Operations Superintendent with temporary 250 Kilowatt generator. Acquiring additional water rights was proposed by TetraTech to serve projected development at an estimated cost of $875,000.PROJECT STATUS: Through working with various west slope entities and Denver Water, the District was able to secure adequate water to service projected future development. Total cost to the District for securing this water under the Colorado Cooperative River Agreement was less than $125,000. This Agreement was finalized in September of 2013. A one million gallon water storage facility to serve the Base II area is planned, to not only provide needed storage, but also balance water supply in the Base II area for both the north and south side of the valley. Locating a new water tank on the north side of the valley should improve fire flow and supply to the north side of the Base II area. Projected costs for this tank and the accompanying transmission lines is $3,019,000, in 2013 dollars. This is a long term project that will take a number of years to secure permits and land use approvals.PROJECT STATUS: TetraTech is currently preparing the feasibility and siting analysis for this Base II Water Storage Facility. This siting analysis will analyze the costs, impacts and feasibility of various alternative tank locations. A draft feasibility study will be provided to the Board of Directors at their regular meeting on February 11, 2014. Staff will request that the Board direct them to approach the United States Forest Service (USFS) with this information, and start discussion about potential opportunities to site this new tank on lands administered by the USFS. A water treatment facility in the Base III area is needed to augment or replace the existing pumphouse and clearwell, which have been in use for almost 40 years. The new treatment facility, and especially expanded clearwell, is needed to meet ultimate demands in the Base III area. In addition to expanded capacity, this facility will also address the ongoing issues with the treatment of iron and manganese, along with improving the effectiveness of disinfection chemicals.PROJECT STATUS: TetraTech is currently preparing a site alternative and feasibility analysis for this Base III Water Treatment Facility. More specifically this work includes: preparation of a conceptual layout for the treatment facility, including additional treatment that may be required in the future, identification of four alternative locations, identification of property owners and easement requirements and preparation of schematic cost. Initial siting will be provided to the Board of Directors at their regular meeting on February 11, 2014 with the remaining work effort being completed in early March. Staff will be requesting that the Board direct them to initiate conversations with property owners of lands which are identified in the feasibility study to solicit their cooperation in working with the District to locate the new water treatment facility. This analysis is important in helping the District understand the costs, benefits and issues relative to these alternative sites. With this information in hand, staff will be able to initiate discussion with private land owners to secure a site for this treatment facility. Once land owner approval is received for siting the facility, more detailed design work will be initiated.